Visit us in Booth # 307 Get Empowered Build your business around a Trotec www.jdsindustries.com 800.843.8853 Industry-Leading Tech Support SUBLIMATION SPECIALISTS Booth #314 Visit us at FREE Support! www.fastsigns.com Co-Brand or Convert Your Business! Visit us at Booth 112. When Did You See The Sign? 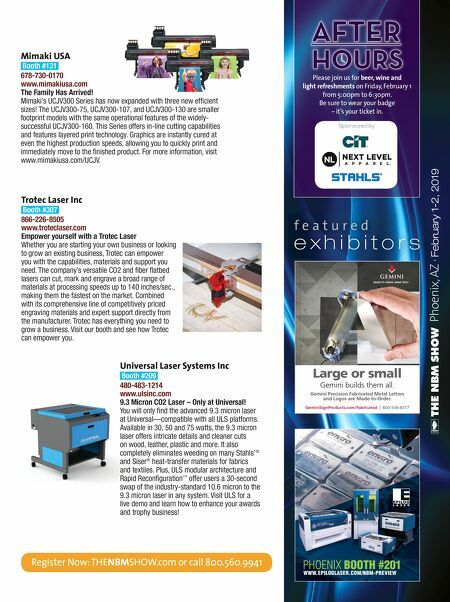 ™ f e a t u r e d e x h i b i t o r s Phoenix, AZ · February 1-2, 2019 Epilog Laser Booth #201 303-277-1188 www.epiloglaser.com Find the Right Laser for your Application Whether you're looking to upgrade to a larger system or adding a more compact unit to assist with increased production demands, Epilog Laser has the right system to meet your needs. Our powerful, user-friendly, USA-made equipment can tackle all of your engraving/cutting needs on so many substrates! Make sure to stop by our booth for a hands-on demo and laser samples. FASTSIGNS International Inc Booth #112 214-346-5679 www.fastsigns.com FASTSIGNS International is the worldwide franchisor for almost 700 FASTSIGNS ® sign, graphic and visual communications centers in more than ten countries. 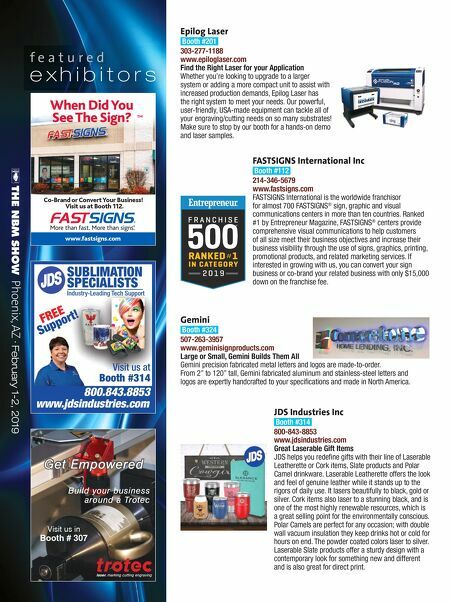 Ranked #1 by Entrepreneur Magazine, FASTSIGNS ® centers provide comprehensive visual communications to help customers of all size meet their business objectives and increase their business visibility through the use of signs, graphics, printing, promotional products, and related marketing services. If interested in growing with us, you can convert your sign business or co-brand your related business with only $15,000 down on the franchise fee. Gemini Booth #324 507-263-3957 www.geminisignproducts.com Large or Small, Gemini Builds Them All Gemini precision fabricated metal letters and logos are made-to-order. From 2" to 120" tall, Gemini fabricated aluminum and stainless-steel letters and logos are expertly handcrafted to your specifications and made in North America. JDS Industries Inc Booth #314 800-843-8853 www.jdsindustries.com Great Laserable Gift Items JDS helps you redefine gifts with their line of Laserable Leatherette or Cork items, Slate products and Polar Camel drinkware. Laserable Leatherette offers the look and feel of genuine leather while it stands up to the rigors of daily use. It lasers beautifully to black, gold or silver. Cork items also laser to a stunning black, and is one of the most highly renewable resources, which is a great selling point for the environmentally conscious. Polar Camels are perfect for any occasion; with double wall vacuum insulation they keep drinks hot or cold for hours on end. The powder coated colors laser to silver. Laserable Slate products offer a sturdy design with a contemporary look for something new and different and is also great for direct print.